Still on parole after his release from Strangeways, and half-committed to running a PI operation from the back of the Manchester gym run by his buddy Paulo, Cal Innes finds himself trapped between a rock and a rockier place when local hood Morris Tiernan asks him to track down a dealer who has done a bunk with a bag of swag from one of Tiernan's illegal gambling dens. Problems enough for Cal, whose conditions of parole naturally preclude him from associating with the criminal fraternity, but when Tiernan's psychotic son Mo takes a personal interest in Cal's case, things quickly spiral out of control. 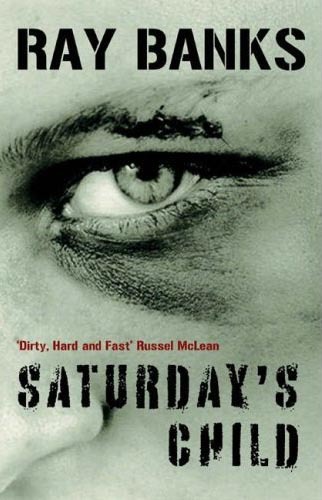 Laced with pitch-black humour, SATURDAY'S CHILD finds us in the kind of territory Ted Lewis carved out in JACK'S RETURN HOME (aka GET CARTER) - literally, as the action moves to Newcastle - with boxing fan Cal more than punching above his weight in such illustrious company. But while SATURDAY'S CHILD is a masterclass in generating story via character, and deserves to be lauded as one of Britain's finest examples of gritty noir, it's Banks' flair for character that allows him to sidestep the conventions of the genre. Utterly compelling, Innes is a flawed hero who confounds the classic trope of the tarnished knight - Banks, in concentrating on the flawed aspect of his protagonist, takes Cal beyond the horizon and into a whole new realm. Cal isn't simply a good guy doing the wrong thing for the right reasons, as is often the case. His flaws set the paradigm of the story, spilling out off margins and resonating long after the final page is turned. The conventional flawed hero will generally find redemption, no matter how poisoned it is, a redemption that allows him to accommodate his various and occasionally homicidal flaws, content in the knowledge that his unique talents are required if society is to sleep peacefully at night. But in pushing his painfully realistic creation to the limit, and beyond, of what is acceptable in a fictional hero of the crime novel, Banks poses tough questions about our willingness to swallow the sugar-coated pill of traditional crime narrative resolution, querying our desire to believe in tough guy equivalents of tooth fairies. If it's simple answers that you require of your crime fiction, pat resolutions and happy-ever-afters, SATURDAY'S CHILD will prove a harrowing experience. This Saturday's child doesn't just work hard for a living; he's working hard just to live. Bleakly, desperately funny, Ray Banks offers us a glimpse of what Samuel Beckett might have read like had he turned his hand to crime fiction. Declan blogs at Crime Always Pays.